Tsubaki of Canada is a one-stop shop for all your premium chain and sprocket needs. For bulk material handling applications, rely on Tsubaki’s field experience and manufacturing knowledge of drum sprockets and complete shaft assemblies. Whatever design, hub style or construction type you require, Tsubaki can customize the most suitable drum sprocket and assemblies. The standard for most applications are full-face drum sprockets. It has an increased surface area that results in lower contact pressure between the sprocket and the chain providing greater wearability. For a sprocket that can handle greater misalignment, A-plate drum sprocket could be a perfect alternative, and provide bulk material pass-through. However, less contact area may result in lower life. Optional style with a flange is also offered, where a separate piece is welded to a plate. Three hub styles are available: Style 1, for bores up to 3-15/16”; Style 2, with double-hub plates for bores greater than 4”. Split Taper bushings are standard for single style hubs; and Style 3, XTB type bushings are recommended for double-hub construction for easy installation. 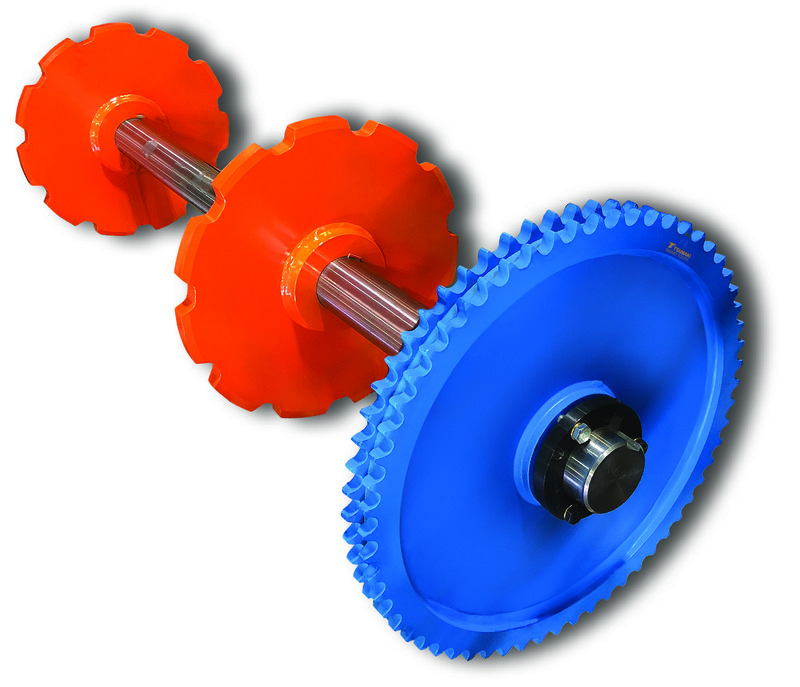 Drum sprockets come in single, double or triple construction. Teeth of the single drum sprocket engage with the chain and provide positive transaction. The can is the main structural member of the drum assembly, which can also be supplied without teeth to create a traction wheel or idler. Double drum sprocket is supplied with a shroud to provide structural rigidity and strength, unless requested by the customer otherwise. On a triple-strand drum assembly or greater, support plates are installed to provide additional strength. For any of your customized requirements, contact the experts at Tsubaki! 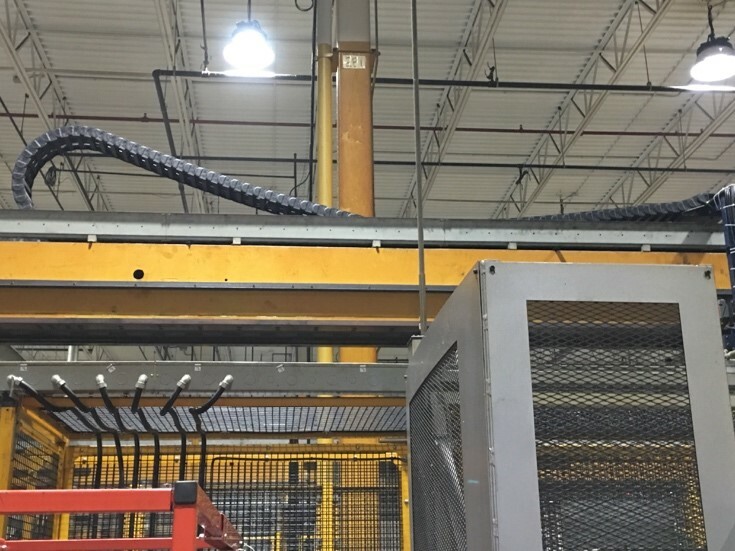 An Ontario based automotive parts company have had issues with their overhead gantry crane. The previous installation was using a competitor’s plastic cable carrier. It is a long carrier that glides on itself. Due to the length, the links would snap at the bend as it travels causing the cables to pop out of the carrier. The links were breaking every two to four weeks causing downtime and application issues. After inspecting the issue, Tsubaki recommended a hybrid cable carrier, Varitrak MC. Varitrak MC has a locking bolt mechanism that gives more rigidity to the installation. Aluminum frame stays were also installed for additional strength in avoiding the cables to pop out. To prevent the carrier from breaking, Tsubaki recommended the addition of RKR links that allowed the system some allowance to reverse backwards. When application travel exceeds the self-supporting length of the carrier, Varitrak MC carrier systems are designed to glide on themselves in a guide channel. Read below for a quick Tsubaki troubleshooting guide for commonly occurring problems with roller chain and sprockets. Problem: Chain is riding up on the sprocket. Roller chain and sprockets do not match. Chain load is exceeding limit. Chain elongation caused by wear or worn sprocket teeth. Replace chain or sprocket and match with correct size. Reduce load or increase chain strands or chain size to uphold greater load. Replace chain and sprockets with new ones. Incorrect installation of the sprocket or shaft. Loose bearings or chain casing. Chain has excessive or insufficient slack. Inspect and tighten all bolts and nuts. Fix distance between shafts for appropriate amount of slack. Replace with new chain and sprocket. Lubricate adequately based on operating environment. Problem: Chain is vibrating excessively. Vibrating with external force is caused by a combination of chain speed, tension and distance between drive and driven sprocket.Load fluctuations are excessively large. a) Change natural frequency of chain. Change tension by either applying an initial tension or adjusting existing one. Install tensioner to change chain span. Replace chain size or add multiple strands. Change sprocket’s rotation speed. Re-evaluate device set-up. Install a self- adjusting tensioner on slack side. Reduce fluctuations with fluid coupling or similar technique. Problem: Chain has poor separation from sprocket teeth, resulting into winding into sprocket. Too large of a span between shafts. Chain elongation due to chain wear or worn sprocket teeth. Install a tensioner. Adjust chain length or distance between shafts. Environmental factors can cause rust if surface is not protected by appropriate lubricant. Lubrication can reduce friction while also providing a seal against dust, dirt and water. This helps to reduce oxidation and prevent rusting. Problem: Inside surface of link plates and sides of sprocket teeth are excessively worn. Chain and sprocket are misaligned. Correct installation and alignment of sprocket and shaft. Problem: Link plate side surfaces and pin heads are excessively worn. Check guide’s condition and increase gap between guides and the chain. Problem: Improper bending of chain and tight joints. Contamination caused by dust or dirt. Excessive load or bent in pin. Seizing of pin and bushing from high speed operation, leading to improper bending and chain breakage. Wash chain separately and lubricate accordingly. Reduce load or increase number of chains or size. Install chain chasing for protection. Adjust level of lubrication based on operating conditions. Adjust operating conditions (ex. speed, load, lubrication). Problem: Spreading of link plates. Improper installation is causing uneven or excessive loading. Correct installation and replace with new chain.